We are proud to have installed DeLaval's first Voluntary Milking System in New Zealand and congratulate Heritage Farm on their innovation. DeLaval's Voluntary Milking System helps you achieve more from your herd with less resources. The VMS gives you more control over how you manage your farm, automating the milking process allowing you to free up more time to focus on managing your herd. This project was unique being the first installation of its kind in NZ. Wayne and Craig (now certified VMS Service technicians) went to Delaval's Head office and manufacturing plant in Sweden to under go training especially for the install. 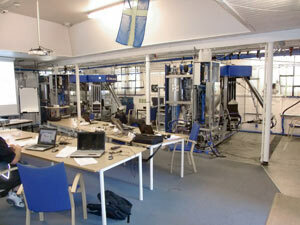 The VMS units are widely used internationally however still relatively new to the NZ market. This project was extremely interesting and challenging to work on but yet extremely rewarding. For more information regarding this project, contact us today! 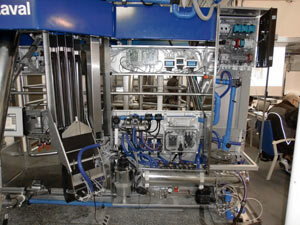 Installation of the PR1100 Delaval 60 Bail Rotary. We needed a shed that was suitable for a herd of 600 cows and provided the farmer with an efficient milking system, the PR1100 platform was the obvious choice. The PR1100 is a galvanised steel bail used as a solution for farmers who require no or little milking automation equipment. The bails low profile yet sturdy construction promotes superior cow flow, on and off the platform. The low milk tube connection point also allows for excellent cluster alignment. The 60 bail rotary consisted of a concrete deck which provides a quiet milking environment and efficient cow flow from the concrete bridge to platform. We also fitted the shed with a Delaval feed system and Delaval cup removers with retention arms ensuring cows cannot exit the platform until they have finished milking.